It's that time again! I've gone through another notebook. I use them for to-do lists, lists of things I've done, class ideas, etc. My favorite style is the Mead Cambridge business notebook that is 9 1/5" long and 5 3/8" wide. I have only found this particular one at Office Max. With so many people going back to planners, I did revisit the idea of using a Daytimer or some other planner system again. I lived by my Daytimer in the 90's and early 2000's but my life has changed. I have far fewer appointments but just as many lists if not more. So I needed to stick with something more free form. This year though it dawned on me that I have an electronic die cutter that could cut out all those little holes and slits for me. The crop-a-dile will cut through anything but it is tedious compared to putting a paper on a mat and pressing a button. So after a couple of fits and starts, I set up a Silhouette file to do a cover. It is a dream! Fortunately, the Silhouette software uses a lot of the same conventions as PowerPoint so it was fairly easy to get it to do what I told it to. 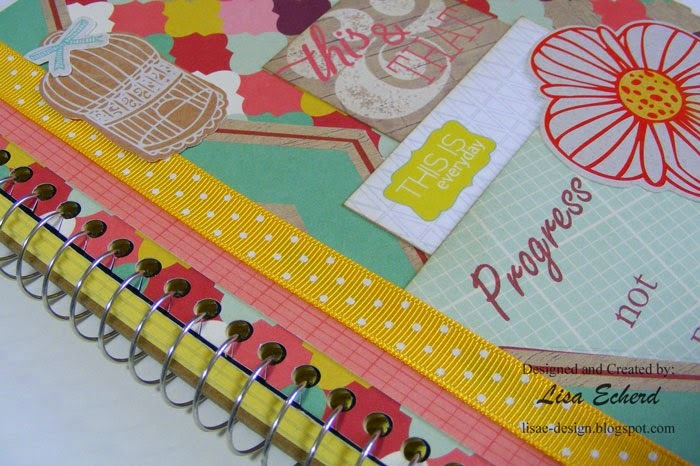 It makes me want to create some other files for different kinds of notebooks. Hopefully, I'll get to that soon. Right now I'm still busy getting the video editing for the Stencil class coming up. With concentrating on that, I won't have a scrapbook process video this week. I do have a video below on the notebook cover. 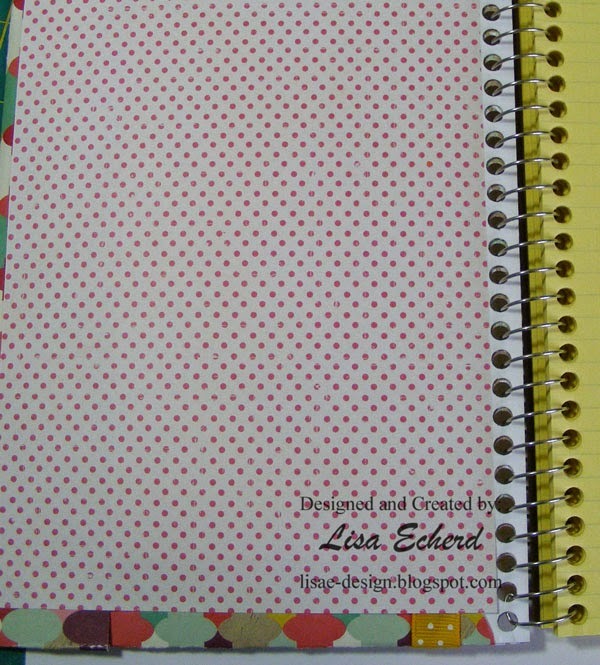 Here is an inside view of the notebook. 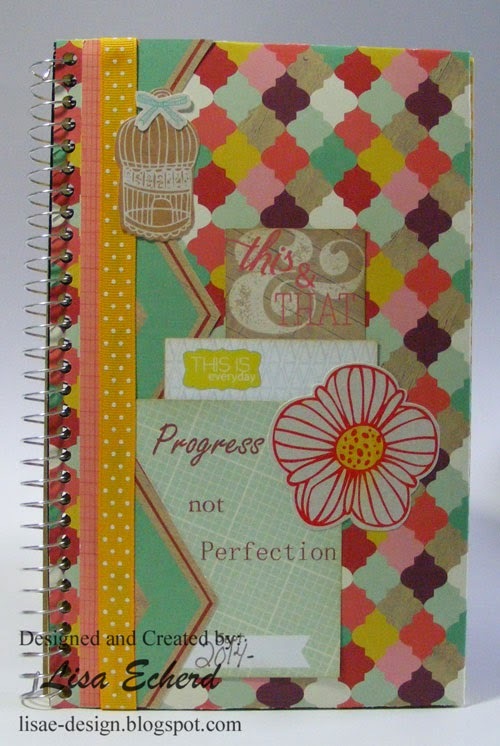 If you happen to use this style of notebook, here is the Mead Cambridge Notebook Cover Silhouette file. You may download for personal use. Lisa, this is really cute! Always love your notebook designs. No exception with this one! Everytime I see a post about this machine….I get an itch to get one, teehee. What a marvelous idea to use the cameo! I am a big supporter of making list too! Love that! And I love lists too. I'm thinking this would be a much more fun to keep and then retain as evidence of productivity!